AM radio circuit using TDA1572. The circuit shown below is of a high performance AM receiver designed based on the TDA1572 IC from Philips. The TDA1572 is an integrated AM receiver circuit that has all essential circuitries like RF amplifier, mixer, IF amplifier, AGC circuit, signal strength indicator driver, audio pre amplifier, controlled oscillator etc incorporated into it. The frequency of the internal oscillator can be up to 50Hz and the IC can accept RF inputs up to 500mV. The inputs of the IC are static protected and the separately buffered, voltage controlled oscillator makes it possible to use simple coils in the circuit. Inductor L1 connected between pins 14 and 13 of the IC sets the oscillator frequency. Potentiometer R12 is used to vary the voltage across the varicap diode D2 for tuning. C4 is associated with the internal balanced full wave detector circuit. Pin 11 is the output if the internal field strength indicator circuit. The output available at this pin will be a function of the available field strength and has a good linearity for logarithmic input signals. The intermediate frequency of this circuit is set around 455 KHz. The band pass filter circuit made around CF1 and CF2 selects the 6KHz band around the intermediate frequency. In simple words, the IF output from the double balanced mixer available at pin is filtered and applied to the input of the gain controlled IF amplifier Filter capacitors C16 and C17 are used for reducing AGC settling time. Transistor Q2 and associated components form the driver circuit for the field strength meter M1. Preset resistors R5and R9 can be used for setting the meter. Capacitor C3 is the bypass capacitor for the audio frequency preamplifier circuit inside the IC. Capacitor C16 and C12 bypasses noise (if any) from the power supply line. TDA7052 forms a 1W audio amplifier stage for driving the loudspeaker. TDA7052 is an integrated bridge amplifier that can deliver 1W output power into an 8 ohm loudspeaker. Capacitor C18 couples the audio output of the TDA1572 to the TDA7052. Potentiometer R10 can be used for controlling the volume. 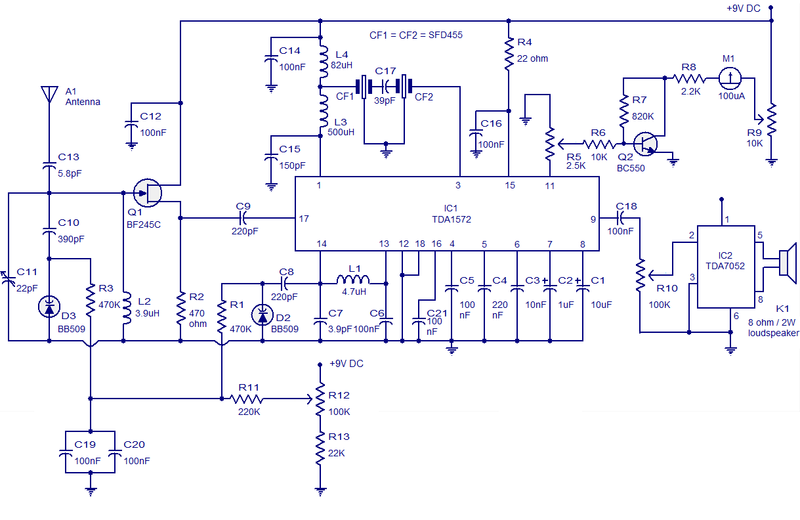 Use 9V DC for powering the circuit. A 9V PP3 battery is the best option as it reduces noise and improves performance. If you are using a battery eliminator for powering the circuit, then it must be well regulated and filtered. CF1 and CF2 are SFD455 ceramic filters. POT 12 can be used for tuning and it should be a multi turn type. Single turn potentiometers would not work here. Meter M1 should be rated 100uA FSD. K1 can be an 8 ohm / 2W loudspeaker. Are there any shortwave transmitter circuit diagram available Please thx. Can you give the frequency range of this circuit? yogesh kumar why you said “inductor design is hard word” i can’t understand.please tell me.